Amazon (NASDAQ:AMZN), Alphabet (NASDAQ:GOOG, NASDAQ:GOOGL) and Netflix (NASDAQ:NFLX) have all reported earnings and all three have gone lower. Will Facebook (NASDAQ:FB) be any different when its quarterly results hit the wire after the close on Tuesday? Long-term investors still in the name hope so, given that Facebook stock has already now fallen from almost $220 at its highs to $145. In an ordinary tape, buying FB stock “into the hole” or after a monstrous decline would be a no-brainer. Its Instagram property is one of the most powerful in the world, while its Facebook platform remains a profit and advertising machine. Its WhatsApp acquisition got the company into the chat game and its Oculus purchase puts it squarely in the VR race. That said, Facebook stock has been a huge disappointment, falling 18% so far this year and more than 30% from its July highs. On Friday it closed notably below long-term support, and that makes me timid to buy the name just ahead of earnings, particularly with the way the rest of FANG is trading. On Friday, shares fell 3.7% and closed at a new 52-week low of $145.37. That’s too bad, as FB stock had been holding up surprisingly well. Despite all of the selling pressure in the stock market so far this month, Facebook stock was only down about 5% to 6%. That’s because $150 support had been holding up — the same lows that came in April during the Cambridge Analytica scandal. Had they held over the next two days into earnings, FB stock would be a tempting long, at least purely from a risk/reward perspective. Now we’re below support and it’s a much tougher play … perhaps too tough and too risky in an environment like this. Why? A rally back over $150 support into earnings could set up FB stock to selloff on earnings and perhaps take out its Friday lows near $145. Conversely, a continued decline into the print brings the risk of a rally back to $150 on earnings, only to see that level act as resistance. In the latter case, this would almost guarantee that Facebook stock is heading lower. All that said, at least Facebook is resting on channel support. I’d love to see it break out of this channel (blue lines), particularly as it would put FB stock above the $150 mark as well. 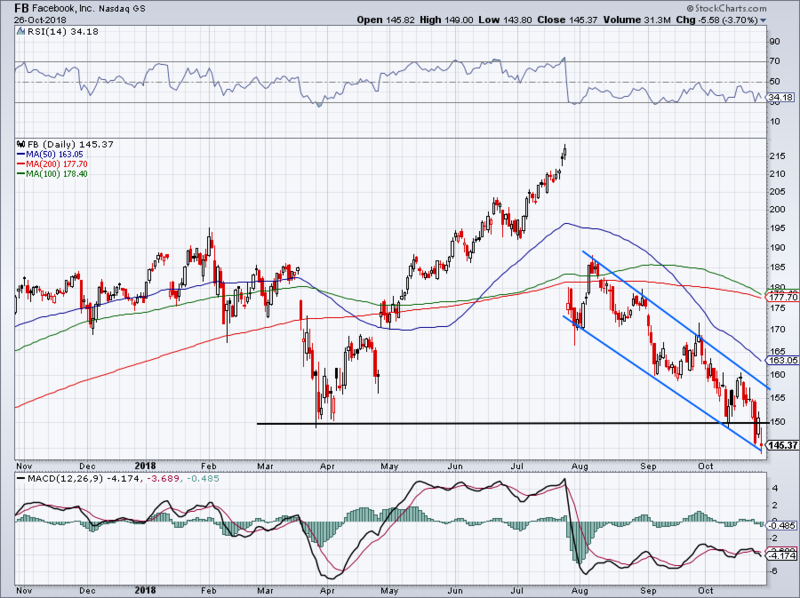 On the downside, a close below $150 post-earnings would be a serious concern of mine. After such a decline, many may wonder whether Facebook stock is now a good long-term bargain. Is that the case? On a trailing price-to-earnings (P/E) basis, FB stock has never been this cheap. On a more forward-looking basis, shares trade at just 22 time this year’s estimates and only 17.4 times next year’s expectations. 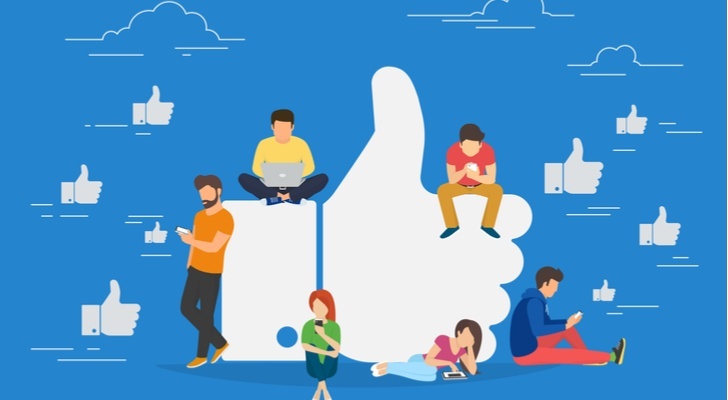 Analysts expect Facebook to grow earnings 33% to $7.17 a share this year, while consensus expectations call for 36.7% revenue growth to $55.6 billion. Those figures are impressive, but the larger concern rests with next year. Facebook management had a very cautious tone last quarter, one that sent shockwaves through its investor base. It made it feel as though the growth days were over as advertising integrity is prioritized over ad revenue and that spending on things like cyber security increases significantly. In other words, Facebook is maturing and there are questions on how far its current lineup can carry it. It’s not like Twitter (NYSE:TWTR) which is starting to hit its groove or Snap (NYSE:SNAP) which can’t find its footing. While Facebook may be maturing, it’s still got some pep in its step. Analysts expect sales to grow 25% next year to go along with 16% earnings growth. Expectations are only worth so much though. Given the dour tone on the last conference call, let’s hear what management has to say on this one before taking a position. 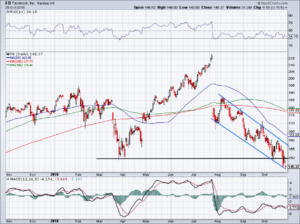 And let’s see if FB stock can get back above $150 support and possibly break out of that downward channel. Bret Kenwell is the manager and author of Future Blue Chips and is on Twitter @BretKenwell. As of this writing, Bret Kenwell is long GOOGL. Article printed from InvestorPlace Media, https://investorplace.com/2018/10/facebook-stock-fb-stock-buy-earnings-preview/.